I will be speaking at the Dearborn Disability Awareness Day event this year - Pathways to Possibilities is being held on Thursday, 18 October 2007, at the Ford Community and Performing Arts Center in Dearborn, Michigan from 9:30 a.m. to 4:00 p.m. It is free, and there will be speakers, workshops, demonstrations, and displays. Below is an introduction to what I will be talking about at Noon. 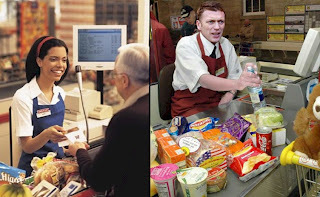 Traveling in Ireland recently my companion and I were on our fourth city, and perhaps our fifth visit to a "Tesco," (the largest supermarket/superstore chain in the United Kingdom and Ireland) when she looked at me and said, "every cashier sits down in this country." I might have said something like, "of course," but then I realized what she was saying. In the US many, many people are kept out of cashiering jobs because they cannot stand on their feet all day long. The Irish cashiers almost universally had drinks and even snacks with them. In the US, we both knew, if an employee needed to have that for reasons of comfort or medical condition, it would often be a fight to get the accommodation. So unlike most US retailers, Tesco, a stunningly successful business now beginning to invade the United States, has eliminated the need for numerous of the accommodations American employers need to make to meet ADA (Americans with Disabilities Act) requirements. In fact, they have eliminated the need for many of their employees to label themselves as "disabled." And they have done it through a simple concept called "Universal Design." We all know "universal design". We can wheel our baby's strollers and our kids can ride their bicycles easily from sidewalk to street because curb cuts have made that possible, while allowing wheelchair users to make the same trip. When we sit down at our computer our spell-check makes up for the fact that most of us have not committed the dictionary to memory. And we are all thankful for that early bit of "UD" the elevator, which made high office floors accessible to wheelchair users, the elderly, the temporarily hurt, or if we just do not want to walk up ten flights of stairs. The car is another bit of universal design. Some of us in 1850 could have walked twenty miles to work each morning, but many of us could not, and many more would not want to. For some the car thus became a convenience, for others a life solution – allowing them to live more complete lives. Adding adjustable stools to cashiers' positions is one way that American business could dramatically change the way we define ability and disability in the United States, and it would enable millions more people to see good jobs, but it is just one of hundreds of free or inexpensive ways that Universal Design can be embraced. The keyboard is another obvious roadblock for many. Companies, and especially governments, continue to give pre-employment keyboarding tests for many jobs, and continue to use the antiquated keyboard design that comes standard in the computer box. These systems not only define many as "disabled" but go further, literally causing disabilities through horrid design. But there are hundreds of keyboard types to fit every hand shape, size, and capability, and dozens of alternative ways to get words and data into a computer. Big Keys and FrogPads, Left-Handed and "naturally" shaped keyboards. Speech Recognition and on-screen keyboards, even the keypad on a mobile phone can become an entry device. How the data reaches the computer does not matter, the best way is whatever way is best for the employee. Changing this attitude will make hundreds of millions comfortable, and less susceptible to carpal tunnel syndrome. For tens of millions it will make satisfying and rewarding work possible. So much of our workplaces are standardized when they should not be. How often do corporate rules prevent the hiring of the best employees? The answer is very often. We know this because "the best" gravitate to "the best companies." There is a reason the corporations which cannot survive without hiring the best minds go out of their way to allow individualization, of offices, of the work schedule, of computers, of methods of production. But even if a firm is not a Google with flex work days and door-to-door mass transit and pets in the offices, or an IBM with the software "brains" most often working from home, businesses can make choices that make the many more comfortable, and the "disabled" part of the mainstream of life. Sit or stand? How about leaving that to the worker. Type of keyboard? Buy a few different as examples and let employees choose. The same for office chairs, for computer mice, for desk heights (yes, you can adjust them, but how often do you?). Always allow employees to bring their own lights to their own offices. Encourage computer individualization – why would a company care if an employee "reads" or "listens" to their emails, or gets your most recent memo via paper or iPod? The bottom line is to get the job done, and done so that the customer is served. The methods of internal information exchange, or whether the office seating is from Steelcase or is an electric wheelchair, make no difference. The rule should always be flexibility unless it makes business impossible. Universal Design is not really a new idea. If we are old enough we saw it in place consistently. The cashier at a local hardware store had the use of just one arm, an injured war veteran. When he worked a board was clamped to the counter to his left, giving him an extra surface from which he could sweep the purchased items into the bags. At the local beverage company a production worker whose leg had been injured sat on a specially constructed high stool and continued his job. The man at the counter at the neighborhood laundry was deaf, a large stack of scrap paper and some pencils sat right there, ready to enable communication. The short grocery clerk used a long-handled "grabber" to pull items down from the upper shelves of crowded urban stores. Even the President of the United States – back in the early 1960s – needed a special rocking chair in his office to ease the back pain from his war injury and allow himself to continue working. But over the years management experts and efficiency experts have pushed us to pretend that we are all the same, that we should all work in identical environments, that we should all use the same tools, methods, and schedules. That is not just silly, it is anti-human. It makes the days miserable for most, and impossible for too many. In an economy where we must use all the talents we have if we hope to be competitive, we must toss out this notion that human workers are exactly interchangeable parts. We must embrace Universal Design, and the full diversity of our potential workforce. 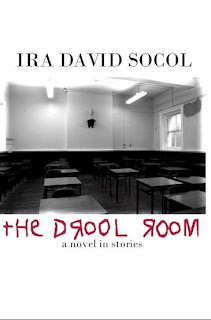 The Drool Room by Ira David Socol, a novel in stories that has - as at least one focus - life within "Special Education" - is now available from the River Foyle Press through lulu.com. I don't think I could use a standard keyboard anymore. I use the Microsoft Natural Ergonomic keyboard. I have it positioned to support my wrists. I've never seen a keyboard like this in an office.